The photographer in question is Bob Hamilton, who has quite a few Landscape Galleries of Scotland and Europe online. In there we find the Images of Scotland, moving further in The Distilleries and finally our destination: Islay. 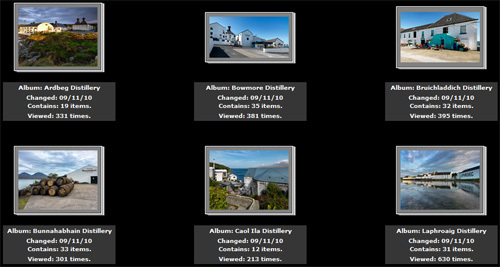 In here we find albums of six of the Islay distilleries, Ardbeg Distillery, Bowmore Distillery, Bruichladdich Distillery, Bunnahabhain Distillery, Caol Ila Distillery and Laphroaig Distillery. Some of my favourites include A 10621 Laphroaig Distillery at Dawn, A 10474 Daybreak on Ardbeg Distillery, A 10419 Ardbeg Distillery - Wash Backs and Still House and A 10847 Bowmore Distillery - Malting Floor Window, Bowmore and the distant Paps of Jura.